THE DROPPING of charges in the so called ‘C case’ on Tuesday has acted as a reminder of the need for a referendum on children’s rights to be held at the earliest possible opportunity according to Sinn Féin Spokesperson on Children Caoimhghín Ó Caoláin TD. The Sinn Féin TD was speaking after a man, whose successful Supreme Court challenge led to the unlawful carnal knowledge legislation in the 26 Counties being declared unconstitutional, had sexual assault charges against him dropped at Dublin Circuit Criminal Court. Prosecuting Counsel told Judge Patricia Ryan that the State wished to enter a nolle prosequi in relation to the charges against the man known as ‘Mr C’. His lawyer said that as no further charges were outstanding against his client he should be discharged from the indictment. ‘Mr C’ was facing the sexual assault charges after a nolle prosequi had been entered earlier in relation to the unlawful carnal knowledge charge following the Supreme Court ruling. Ó Caoláin said the previous Fianna Fáil led Government missed the opportunity to hold a referendum on children’s rights last year on the same day as the general election. 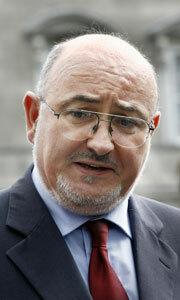 Sinn Féin had proposed that a referendum take place on that day. “Sinn Féin believes that this referendum must introduce a comprehensive set of children’s rights including the right to protection. “We further believe that there is no reason why the referendum cannot take place in 2008 just as there was no valid reason for it not taking place in 2007”, Ó Caoláin said.